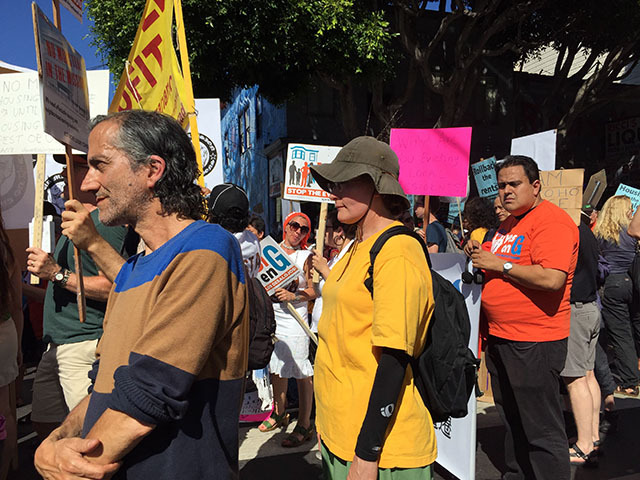 Some 400 protesters marched west on 24th Street this afternoon to rally against a development at the 16th Street Plaza and in support of Proposition G, a ballot measure that would impose a surcharge on developers who flip multi-unit buildings. Under the blazing sun, marchers danced, bobbed and chanted against gentrification. Unlike last year’s march that focused on an eviction tour of recently impacted tenants and buildings, this year’s march seemed trained on the broader picture of the November elections and the more specific 350-unit development at the BART plaza. “I’m here because so many long term San Francisco residents can no longer live here because of a loop hole in the Ellis Act that lets people come in and buy something cheap and then evict the tenants and make a large profit,” said Iris Biblowitz,68-year-old retired nurse who has managed to remain in the Mission. Biblowitz was referring to the Ellis Act, which the state legislature approved in 1985 to give long term landowners a way to exit the rental business. In times of a heated housing market, however, it is increasingly used by developers to purchase a building at a relatively low price because of the long term tenants and then turn around and evict the tenants. They then often sell the units to buyers willing to own a place through a Tenants in Common mortgage and agreement. David Grace who works at a non profit near the 16th Street Plaza said he feared more non profits moving out of the Mission. “Who is going to keep watch on all of this stuff if we are no longer here,” he asked. 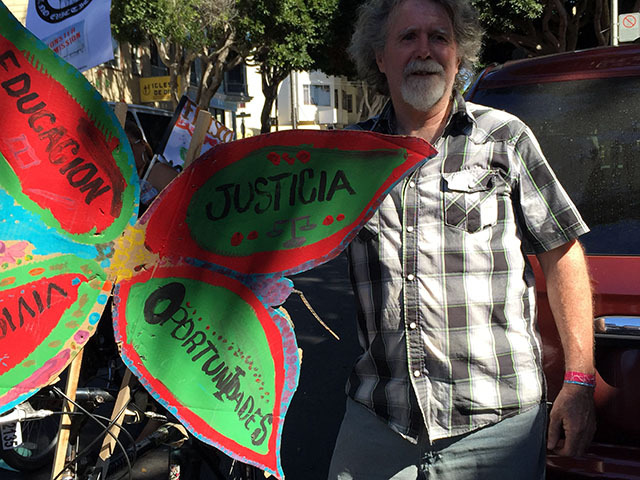 The march will turn north on Mission Street and end at the 16th Street Plaza where there will be a community demonstration and celebration until 6 p.m. Andra Cernavskis will be filing a full report on the march. Why would anti-eviction protesters target a large new building that will bring desperately needed housing into the area? New housing will reduce pressure on current renters. These protesters make no sense at all. We wouldn’t oppose building affordable housing but even teachers and nonprofit workers, let alone most mission residents, couldn’t afford these high end condos. Studies show that building luxury housing drives up rents and evictions in surrounding areas. We are already seeing that here; since they announced this project speculators have been buying up surrounding properties and pushing out tenants. Market rate housing generates the property taxes that pay for all those things you think everyone deserves for free: schools, MUNI, paved streets, sewer, fire department, public health services, police, pensions for public employees, homeless services, subsidized housing, on and on. We need more of it, not less, even if you find people who can afford market rate unlikable and not like you. And how has the city been paying for services all these years? You also omit taxes collected from businesses (unless of course they get a tax break). Walgreens and mcdonalds are high volume businesses, even if you may find them and their clientele unpalatable. Building more housing means more people which means a need for more services. And luxury condo dwellers are demanding. There is only so much service that money can buy, the infrastructure upgrades have physical limits. Overall, this rampant high end development is degrading the quality of life in SF for everybody. So just because you cannot afford one of these homes, they should not be built? Even though there are evidently plenty of people who can afford them and want to live there? Sorry bud, but renting is temporay ( look it up in the dictionary ) that is a fact, just like GRAVITY…..All your stupid proptesting will, NEVER change that fact. Of course they make no sense, they think the properity of others belongs to them for life… That is sick and crazy, not mention pure thivery ! Uh, it’s because the units aren’t affordable to anyone who isn’t rich. If you think this will ease housing costs you’re deluded. You don’t understand supply and demand. Robin, it depends what you mean by “rich”. Most college-educated professionals in the city probably make over 100K a year, so there will be many customers for these new units who are not wealthy by any normal reasonable definition of that word. Are you saying they shouldn’t have the homes they want and can afford? The median household income is around 70k, so your statement is quite wrong. 1 in 3 city workers made more than 100K in 2010 according to SF gate(see article link below). Many in the private sector make this much or more. If the median income is 70K, it is probably true that about 30% or so of the folks in SF make 100K of more. I don’t think that’s a stretch at all. Only about 31% of Americans graduate from a 4 year college. On average, a 4 year degree will get you a higher paying job. I know many people in this city don’t want to believe that, but it is fact. “1 in 3 city workers” is completely different from “1 in 3 city residents”. yes, there are some high paying jobs in SF, everyone knows that … but there are many more that pay about minimum wage. Given the cost of living here, I venture that a livable household income has to be around 80K per household at which point 1/2 of your gross income goes towards housing (1 br if you’re lucky). Let me try again: 50% of SF households have an income less than 70K. These people can’t even afford the market rates for a 1br not to mention mortgages on 1M condos. There are also 7,000 homeless people with practically no income. An income of 100K$ anywhere in the world qualifies as very well off. Though of course if you’re aspiring exclusively for riches, no amount will be enough. The march was beautiful. Great video clips. Itis amazing seeing such a large part of the community come out to support each other. Gentrifcation Now! Gentrification tomorrow! Gentrification forever!!!! Check this out Mr Market Rules – half the new condos get bought by out-of-towners as 2nd homes. You effing brainwashed idiot. Newsflash bucket head….it’s not illegal for out of towner’s to buy condos in SF! Wha’ddaya wanna do? Only sell to SF residents? Communist much? Lets sell the city to the highest bidders that won’t live here, sounds awesome! Bottom line working class people cannot afford to live here anymore! Most people I know do not make $100,000 dollars a year. Most of these protesters have lived here most or all of there life. Like myself, where are they going to go when they are evicted? We need to walk in someone else’s shoes before, making mean spirited comments. It’s called humanity!! I could never afford to buy a home here, but now I can’t even afford to rent a place to live here. I understand things change but things are out of control!!!!! Please don’t make any mean spirited remarks. Thank you!!! What wrong with moving to oakland, and making a community over there? Why should a private landlord subsidize you with low rent for years on end? If SF is getting expensive you can always move to oakland. Living in SF is not an entitlement, I’m sure you would agree. Let’s stop subsidizing SF property owners. Entitled slackers. Great protest. Glad to see it. Good to see the little conservatives squeal and squirm on here a bit. For any young people growing up in this city, please look around and learn the lesson that is right in front of you. If you don’t own your home, you will not have control and can possibly get evicted, have a large rent increase, or something else may happen. Think about saving to buy a place when you are young. Put away 10% of your salary to save for a down payment no matter what your income. Buy something small in an area you can afford and upgrade over time until you get to the neighborhood you want to live in. Equity in your primary home is the best way for people to gain wealth over time. It’s the best way to achieve middle class. Don’t expect to be handed the house/neighborhood your parents grew up in if you do not own it. Take control of your life as opposed to being controlled by your landlord. It isn’t yours unless you own it. It isn’t your unless you own it. This is false advice. All it takes is a simple calculation. For a median household in SF making 70K, 10% is 7K — saving that amount is unrealistic giving the cost of living (and especially housing). That means it will take a decade or more to save for a downpayment for an entry into the housing market. Appreciation alone kills this strategy … unless you want to commute a few hours a day. You can easily lose all your savings and then some by investing in an overheated housing market that will crash and burn. The real advice is that until speculation is ended, until workers earn a living wage, until governments focus on providing a livable environment for the people that society depends on to perform work, the non-wealthy will be at the mercy of an arbitrary and inhumane ‘market’ which is favorable only to the wealthiest citizens.